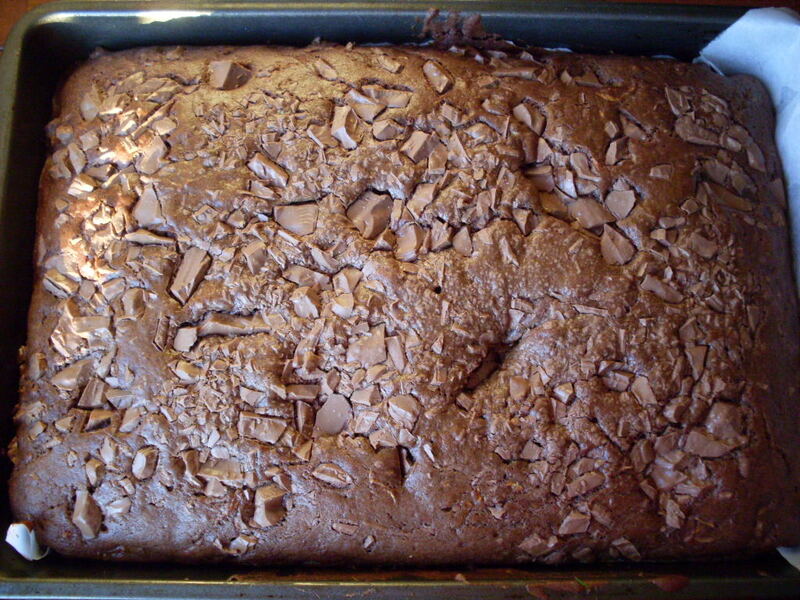 Chocolate zucchini cake: It’s outrageous! Sometime around the advent of cool fonts and colour printing, my mom brought home a recipe for something called “Outrageous Zucchini Cake,” and the recipe was fantastic (cinnamon! Chocolate! A fat-free variation!) but hand-written (by whom? 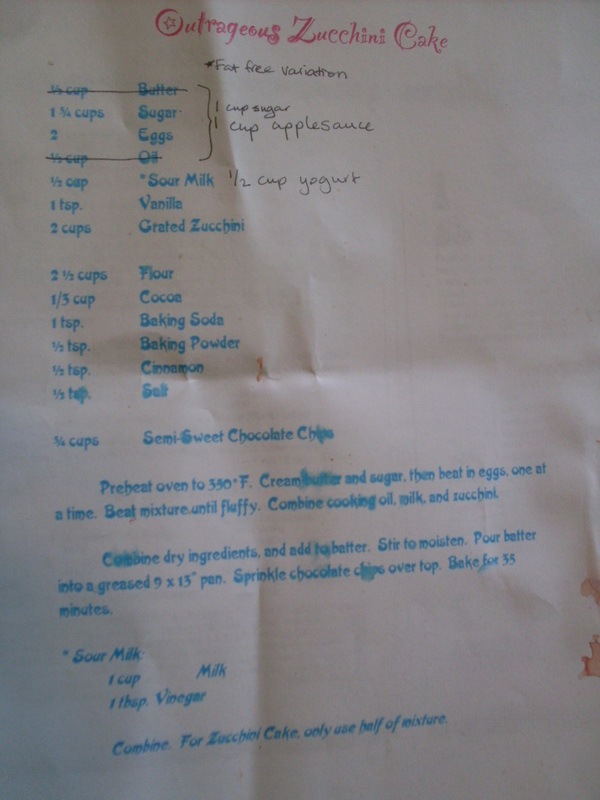 I still don’t know) so I typed it up in magenta and cyan with MS Word’s “Party” font and thus the recipe was saved for a decade or more in a tattered binder that lives in my parents’ kitchen. It looked so pretty. It still sort of does. Which is why I absconded with it this past weekend. The cake it produced was delicious, but I forgot about it because I moved out and didn’t take a copy with me, because even then I suspected that making and eating cakes all on my own would turn out to be a bad idea, fat-free variation or not. I still remember how fat-free was appealing at 17. It is less so at 27. 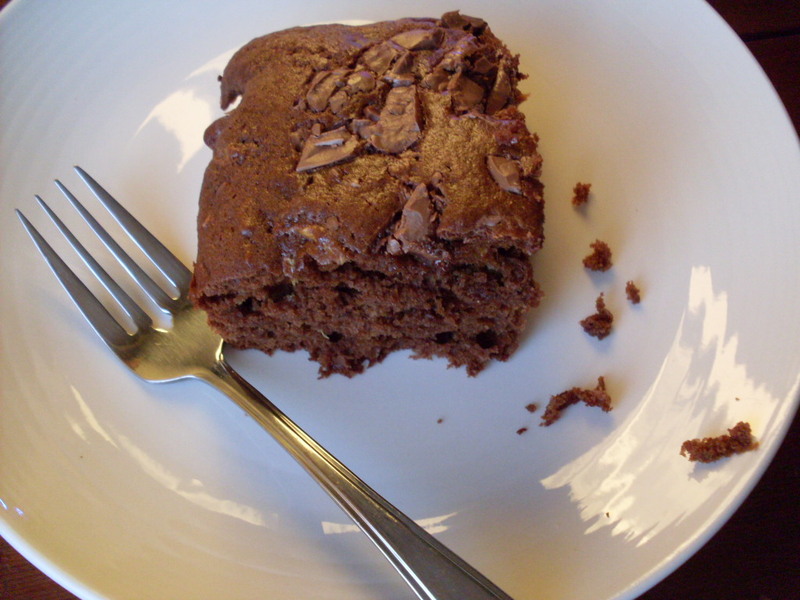 I’ve revised the recipe, and it’s now somewhere in between really fattening and fat-free – that sane middle ground at which a cake can almost pass for healthy. Also I now rationalize my cake-baking by telling myself that there’s two of us now. I pretend as if Nick ever eats more than a single slice of cake, and it’s a lie I can live with. Preheat oven to 350°F, and grease a 9″x13″ baking pan. Beat butter and sugar until fluffy. Add eggs, yogurt, vanilla, and zucchini, and beat until thoroughly combined. 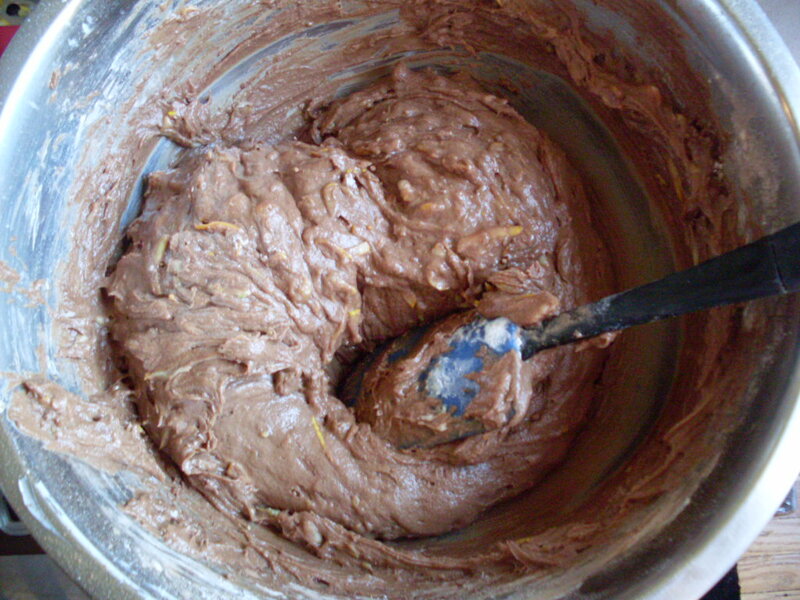 In a separate bowl, whisk together flour, cocoa, baking soda, baking powder, cinnamon, and salt. Stir dry mixture into wet mixture, stirring to moisten. 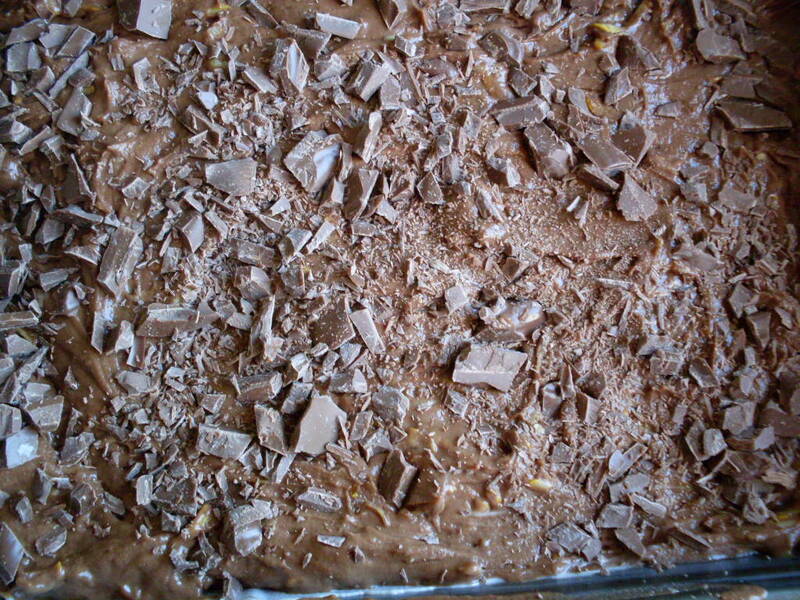 Pour batter into baking pan, spreading batter to the edges and corners of the pan. Sprinkle evenly with chopped chocolate or chocolate chips, and bake for 35 minutes, or until a toothpick inserted into the centre of the cake comes out clean. Serve warm, with a tall glass of cold milk. < Previous Meatless Monday: Huevos Rancheros in Purgatory. Next > Meatless Monday: Fried tofu with plum sauce and some rambling. the only thing i don’t have in my fridge right now is the yogurt, damnit! also, how do you feel about icing on this little guy? what about chocolate glaze? whipped cream? i’ll report back. Ha! You can use buttermilk or sour milk too 🙂 I feel good about icing him, though if I did I might mix the chocolate in with the batter before baking. And everything is better with whipped cream. Let me know! If I remember correctly, it might almost be “brownie” like if frosted. I’d use a healthy dollop of sour cream or cream cheese in the frosting. You do know that is not an actual zucchini, right? What you have pictured is a Summer squash. If you made this recipe with that squash it can be called squash bread, but not zucchini. A zucchini is a big green summer squash, not a yellow one. They have totally different flavors. 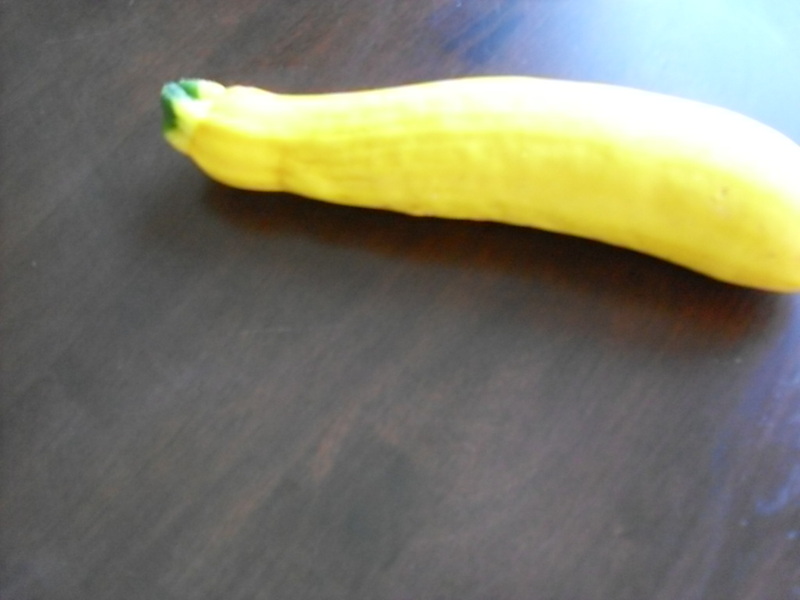 It was a zucchini, a yellow one, I swear! It just had a wrinkly top because I’d left it out all day. I buy yellow zucchini all the time! I even checked the ultimate source for all truthiness. I know what you’re talking about though – there’s a similar-looking plant that does taste different. I am pretty sure Wiki has this one wrong, but wth? who cares as long as the cake is good! my housemate just went to get the fixins… timing is everything i guess. cheers, and I will let you know how it turns out! It is good! And now that I think about it, I do buy yellow zucchini from the same place that advertises “local cauriflower” so there you go. Enjoy! Well Housemate says MMM, mmm, good. so you are off the hook, though we used the green variety of the “zucchini” from our garden… so there ya go… thanks again for putting this recipe out there! Yay! I am glad it worked out!